Which Jeep wheels are best for you? 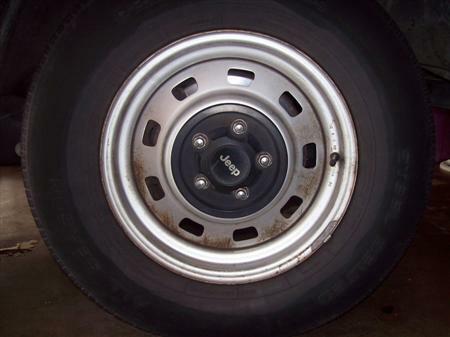 Do your Jeep wheels need to be shiny polished exotic alloys, or will plain factory steel rims suffice? Of course much of this comes down to personal taste and aesthetics to make your pride and joy look really good. However, this beauty contest often comes at a substantial price (that's money). Most stylish wheels are made of aluminum alloys, chromed steel or combinations of various alloys. The aftermarket has produced bumper crops of "custom" wheels to choose from, and some pretty nice looking wheels can be had for a reasonable amount. 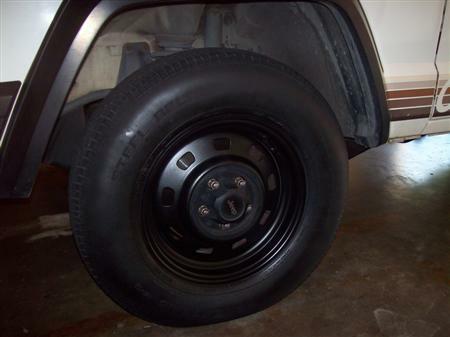 If you drive your Jeep mostly on the pavement without too many bang em'up off-road excursions these nice looking rims should hold up just fine. 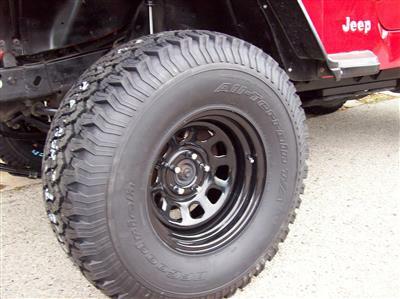 However, would you really want to take your rig off-road shod with $4000+ worth of wheels and off-road racing tires. Maybe so, if you could afford to live next door to Bill Gates! I love the look of nice wheels. Heck, I've seen Jeeps that looked ready for the scrap heap with expensive wheels and tires...and no doubt the visual appeal stands out. Then it all seems to boil down to function vs. frills. Most wheels will do their intended job of going round and round. The question remains though..."is that enough"? For many the answer is "yes". For others the answer is..."can't afford fancy wheels anyway". And for other folks the answer is..."give me the great looking wheels and get out of my way!" Just look around at all the great looking wheels on the road and off. The "eyes" have it! 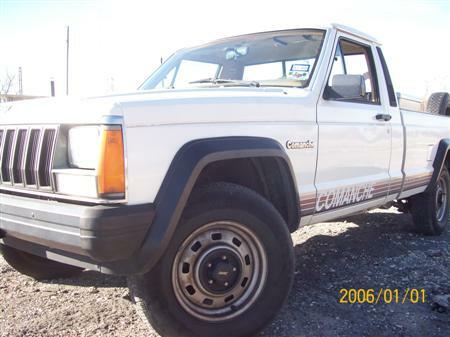 So, watch your budget , but don't hesitate to improve the look of your CJ, Wrangler, Cherokee, Comanche, Willys, Commando, Jeepster, M38, Liberty, Grand Cherokee, etc. with eye grabbin' custom Jeep wheels. 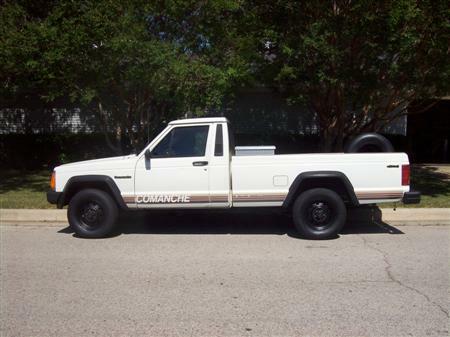 Recently I got to thinking about the wheels on my totally stock 1987 MJ Comanche pickup. 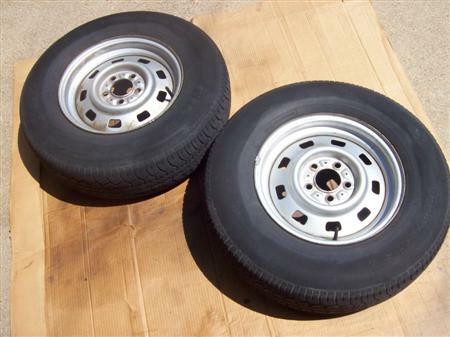 The stock steel wheels were (factory) painted a dull silver-gray color...and had years of scuff marks and a few rust spots on all 4 of them (even the spare). Since the wheel surfaces were still pretty smooth the only preparation I did was to wash the wheel thoroughly at the local car wash...you know...with one of those big soapy brushes and the high pressure rinse. Making sure that everything was dry I wiped the wheels again using a plain soft rag to remove any fine brake dust and film. If they had been oily or covered with road tar I would have used a solvent to remove that mess first...but fortunately they came out pretty clean with just the wash and wipe down. I removed the plastic caps on each wheel which happened to be black and in pretty good shape for re-use. Finally I laid the tires and wheels on a large cardboard box (flattened) to spray on the paint and catch the over-spray. The paint came from Pep Boys Auto Supply. I used the Krylon "Rust Tough Enamel" spray can in semi-flat black. It took about one and a half cans of paint to finish 5 wheels. Each can cost a little over $5.00, but has proven to be quite good. I would use it again on any tough surface...especially where there is some mild residual rust present. 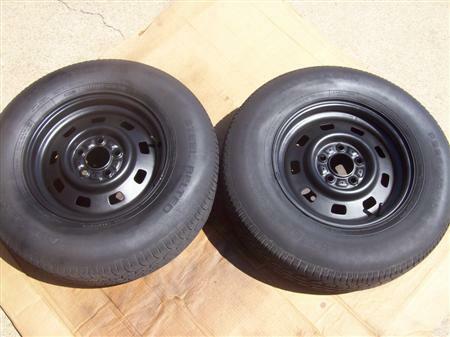 Also, I didn't worry about over-spray on the tires because I don't have white lettering or whitewalls. Anyway, I prefer my tires to be solid black. So I just painted the rims and the tires as well. (The tires were due to be replaced anyway...and have since been changed to a little more aggressive tire). Pretty cool for only about 10 bucks and a little time and elbow grease. Some things don't have to be expensive...especially if you use some common sense and a little creativity.